Study: The Norwegian cyclone storm model is flawed | Watts Up With That? Given the UK’s obsession with the weather, it would seem obvious that the basic understanding of how low pressure systems evolve has been known for a long time. Instead, some of the biggest storms in the UK’s history, such as the Great Storm of October 1987, did not fit this basic understanding. With groundbreaking research, Dr David Schultz, from The University of Manchester believes the way we learn about the weather is wrong and has been wrong for 90 years. Writing in the journal Bulletin of the American Meteorological Society, Dr Schultz, along with his colleague Professor Geraint Vaughan, has worked out that the traditional model for how low pressure systems evolve is deeply flawed. The model, used since the 1920s and devised by Norwegian meteorologists, is that when a storm occludes (evolves), it will automatically begin to weaken and pose little danger of severe weather. However, argues Dr Schultz, this is not the case – occluded storms may well contain strong winds and regions of heavy precipitation. Naturally, many in the public recognize that. The Great Storm of October 1987 and the Burns’ Day storm of January 1990 were both clear reminders: occluded, but still deadly. Dr Schultz’s new model addresses these weaknesses with the Norwegian model because the prior belief that occluded storms were weak could lead to poorly-informed predictions or forecasts. Dr Schultz, from the University’s School of Earth, Atmospheric and Environmental Sciences, claims they now know that the deepening of a low pressure system is not dependent on when a cyclone occludes. Specifically, the new model is called ‘wrap up’, to emphasize that the wind around the occluding cyclone wraps up the low pressure system into an anticlockwise-spiralling cloud pattern. Dr Schultz said: “With this new interpretation of the occlusion process we can explain why not all low pressure systems occlude – the winds are not strong enough to wrap up the storm. “The Norwegian model of low pressure systems served us well for many years, but it’s time to move on. Dr Schultz argues that how we teach about low pressure systems is wrong, and that textbooks, public information guides and models will need to be radically updated to ensure the next generation of meteorologists, as well as the public, are in possession of all the facts. Another result of Dr Schultz’s research is a better explanation for the observed structure of storms. Previously, meteorologists believed that occluded cyclones and their associated fronts could tilt eastward with height or tilt westward with height, roughly in equal measure. This new research demonstrates that westward-tilting occluded fronts are rare and provides an explanation for why. by David M. Schultz and Geraint Vaughan, is available from the Press Office. ← The tides, they are a changin! Anthony, this has got to be the most non-story “revelation” I’ve seen out of a press-release ever…I don’t know anyone in my field that had such flawed conventional wisdom to begin with. It’s also freely available at ametsoc.org – Click the publications link and perform an article search for the title listed in this article. So the science wasn’t settled, then? The Met Office has used nothing but the Norwegian model – proof is in the abject failure of its predictions. 37 Million Taxpayer Pounds and no success. Oh model…..model….model, thou art doomed to fail. I remember the 87 storm because I slept right through it and hundreds of thousands of trees the next day had been blown down. The 90 storm was more memorable as walking in 90mph winds was bad and the River Tees nearly flooded because of it. However more interesting are flat line winds which we had in Memphis TN in 2003 called Hurricane Elvis it lasted only a few minutes but caused untold damage to the power supply in the city lasting a few weeks to repair. I watched that from a kitchen window at 6 am fortuitously enough. Three hours earlier and FEDEX would have lost 3 planes. Having been through 4 hurricanes, including 2 real bastards, I will assure anyone that the model is wrong. I can well remember mini-tornadoes that were so scary that it gave all nature pause. Destroyed a reinforced house in front of my eyes in less than 10 seconds. (All four residents survived in the bath tub) These tornadoes were later to be found circling counter-clockwise to the hurricane. That was Iniki. Top wind measure by the Department of Defense was 227 miles per hour. They refused to allow publication of the result for some reason, even though it was generally known. But no, , no instrumentation , survived. Computers recorded over 230 before the exterior instrumentation went out, I was told by Navy people, but that was considered an artifact. Marcel Leroux explains clearly why then the Norvegian model is flawed, since storms at these latitude can not create themselves, but are the consequence of travelling MPH. These MPH are also driven by relief because of their small thickness, explaining all the regional climate. He also explains why El Nino et La Nina are also the consequence of MPHs. Marcel Leroux was also a sceptic since he very early assess irrelevancy of climatic model because they do not take into account the actual general circulation lacking MPG behaviour. Marcel Leroux deserves a fresher look. His books are really amazing. The models are wrong (again). In many respects the Mobile Polar High concept of Leroux is very useful. The conventional model for depressions provides that the energy for the spinning (and thus the overall wind strength) is dictated by the temperature differentials between the air masses mixing within the depression. The idea is that the air masses have different densities and so respond differentially to the Earth’s rotation to start the mixing and spinning. On that basis it is logical that once the warm sector has all been lifted aloft then those differentials decline and the depression should begin to wind down. However that never did account for many depressions that continued to intensify after occlusion had been completed. There are many such. I have long been aware of that deficiency in the standard model. The Leroux concept is that the movement of the MPH provides the initial ‘push’ to start the spinning and would be capable of adding even more of a push later on even after completion of the occlusion process. That is in fact implicit in my description of a top down solar effect altering the vertical temperature profile of the atmosphere so as to change the intensity of the polar vortex and the size and position of the polar high pressure cells which then behave as Leroux suggests. Furthermore ‘hands on’ weather forecasters have been taking the phenomenon into account for decades. It is only recently that the idea seems to have lost ground with over reliance on models and a consequent loss of practical experience. I remember many occasions in the past when Michael Fish and other well known broadcast meteorologists would explain the powerful northerly behind a passing deep depression as being exacerbated by a gowing high pressure cell giving the winds an additional impetus despite an obviously occluded front. Dr. Schultz may be right but he has discovered nothing new. Rather, he is re stating knowledge that had becme lost. The really important point is why those polar high pressure cells ebb, flow and shift in the first place. That is where I think I am ahead of the game. If my memory serves me correctly and the 1987 Storm is the UK one which Mr Fish got so disastrously wrong then it was made much more powerful because 2 low pressure systems came together when the 1st one stalled just off the south coast and was caught up by the 2nd system. This is very rare as nearly all systems transit over the UK in procession and are quite widely spaced. I remember a recent article about someone who proposed that “everything you know about static electricity is wrong” and proceeded to impute all sorts of nonsense to the conventional wisdom under the guise of correcting the myths. This definitely has the same scent. Having watched a “dying” sub-tropical cyclone rip off roofs and trundle a 250 ton container crane along its track against its brakes, then tip it off the end of the quay, I will only say that extreme weather is not something many models even come close to. In the storm I witnessed the Harbour Control’s anemometer went off the scale – then literally blew away. I can tell you it was no fun trying to cut our way into the 200 gt Pilot Launch trapped beneath the crane as the tide rose with the crew trapped below the crushed superstructure in those winds either. The ‘forecast’ for that day predicted ‘strong winds’ – so I guess they got that bit right. This was in 1987 in South Africa and I recall that a Meteorologist said at the time that they could not really predict what these storms would do in their ‘decay’ phase. New research leads to update to what is thought to be how things work ,, normal science in action. Now lets remember there are those demanding that in one area this should not be case as its ‘settled’ beyond any challenge. Ah Pat, 4 people in a bathtub ? Thanks mods, Anthony and posters … as always. In whatever way the cyclones form, the shapes of the resulting logarithmic spirals appears to be consistent. 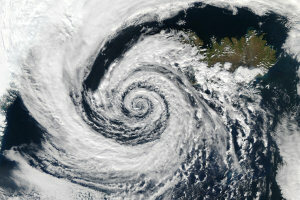 Here is the Icelandic low pressure system used to illustrate the article. Thank you Thierry, I am so glad you are recommending Marcel Leroux’s work, I have mentioned them on several occasions when his work is proven be someone else. I think it is essential when observing Geos satellites and one can clearly follow the origins of cyclonics and anti-cyclonics. storm I think they are referring to the 1987 one in UK. But what about the one in 1953.
suffered worse. Ships were lost. Google 1953 Great Storm. we did experience being on the edge of the hurricane belt. It was hazardous to drive as most of their roads are on the sea front, and waves were washing up over the small cars and the winds so high they threatened to push you over. However, the houses are very strong made from blocks of limestone. But the roar of the wind? And of course some of the flowers were killed from sea spray thrown up. Anyway Norway is unique. It is a land of the midnight sun and polar nights. 22 hours of day and twilight in the summer months and darkness of polar nights in winter. Having been through 4 hurricanes, including 2 real bastards, I will assure anyone that the model is wrong. … That was Iniki. Top wind measure by the Department of Defense was 227 miles per hour. They refused to allow publication of the result for some reason, even though it was generally known. The post is about extratropical storms which form at frontal boundaries and behave very differently than tropical storms. A storm can change between the two types, commonly a tropical storm goes extratropical as it moves over cooler water. That transition is marked by broadening of the wind field loss of the warm core and eyewall, and various other things. I haven’t looked at the paper but I doubt it has anything to add to tropical storm knowledge (and it sounds like it has little to add to extratropical storm knowledge per Ryan). Except for record temperatures at Hawaii airports (/sarc), most remarkable records are subject to critical review. The Mt Washington record certainly was, and the Paka gust was analyzed with almost forensic detail. They found evidence that before the anemometer blew away, broken guy wires allowed the anemometer to swing back and forth, resulting in too high readings. The Iniki reading may have involved the same physics. See http://www.mountwashington.org/about/visitor/recordwind-1997challenge.php for all the details. This paper by Makarieva et al is relevant to the issue also, imo. The amount of ego bugs me, particularly in light of Dr Maue’s statement about the state of the art understanding. Either the guy is seriously delusional about his own importance (ALL books need to be rewritten? ), grossly uniformed or playing to the crowd for tenure’s sake. However one cuts it – it speaks generally why I don’t trust academics…. and why we’re here wrt CAGW. Thanks, I didnt knew Marcel Leroux, I’m going to see more of his work right now! This sounds to me like a scientific consensus that is now wrong. A derecho (from Spanish: “derecho” meaning “straight”) is a widespread and long-lived, violent convectively induced straight-line windstorm that is associated with a fast-moving band of severe thunderstorms in the form of a squall line usually taking the form of a bow echo. Derechos blow in the direction of movement of their associated storms, similar to a gust front, except that the wind is sustained and generally increases in strength behind the “gust” front. A warm weather phenomenon, derechos occur mostly in summer, especially June and July in the Northern Hemisphere. 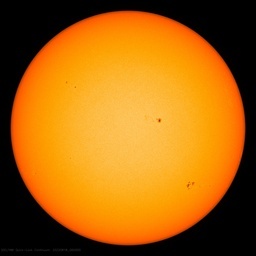 They can occur at any time of the year and occur as frequently at night as in the daylight hours. I love posts about weather. I think they are far more educational than posts about climate. It irks the heck out of me that “climate study” has become the holy grail. But the climate cup was empty of the good stuff. Why? Some idiot decided that weather had nothing to do with climate. Think about it. If all the climate money spent so far had been spent on advanced studies of weather (pattern variations, mechanisms, affects on land and sea, oscillations, forcasting etc), in all likelihood lives and property let alone tax funded cleanups might have been spared. As far as I am concerned, AGW climate scientists and those that fund them are thieves and are indirectly responsible for lost lives and damaged property. And now I have my dander up and my feathers ruffled. Word to the wise, do NOT get a red-headed Irish lass mad. of the destruction of the Amazon rain forest and the effect of the Aswan Dam on the Nile River. to convert into printing presses. That’s human innovation, eh? Well – joking apart. What turned into human progression, drinking wine or reading a book. scientific truths. Now I am Australian and haven’t seen Prof Plimer’s address. age will be upon us soon. Such liars, eh? Just to make a buck! There was an interesting occluded front involved in huge October Rains in Southern New Hampshire, back around 1998 or so. It didn’t weaken, but instead acted something like a pipeline, stretching from a warm sector holding an unwinding hurricane, hundreds of miles out to sea to the southeast, to a stalled or very slow low to our northwest. Rather than the rain getting wrung out of the system, as soon as it occuded, a constant supply of juisy air traveled along the occlusion. I had the feeling the hurricane was unrolling, the unrolled strip traveled up the occuded front pipeline, and then got rolled up again in the storm. It was fascinating to watch the maps. Off Topic: Any chance we could get a thread on Tropical Storm Emily going? Thanks; that was off-topic, but definitely worth the seven minutes it took for Professor Plimer to demolish the “CO2 drives climate” myth. Send it to your favorite schoolteacher! Thank you Thierry for being another voice in bringing the work of the late Professor Marcel Leroux to this discussion! As many have posted before, this link is a good start. His latest book was the second English edition of “Dynamic Analysis of Weather and Climate” completed in May 2008 and published in 2010, two years after his death. PhD. 1983, WMO sponsored and distributed to all member countries. Former Director of the Laboratory of Climatology-Risks-Environment, LCRE (Lyon, France), Université Jean-Moulin. 1. Leroux M. (1983). PhD. Thesis : Le climat de l’Afrique tropicale. Ed. H. Champion/M. Slatkine, Paris/Genève, t.1. : 636 p., 349 fig., t. 2 : notice et atlas de 250 cartes. 3. Author of: “La dynamique du temps et du climat”, Editions Masson, 1996, 310pp, 1st edn; Editions Dunod, 2000, 366 pp, 2nd edn reprinted in 2004. 4. Author of “Dynamic Analysis of Weather and Climate”, J. Wiley ed. Praxis-Wiley series in Atmospheric Physics, London, NY, 365 pp, 1998. Shapiro Keyser (1990) already “fixed” the “flawed” Norwegian cyclone model. I swear, people are issuing press releases just to see their names in print. Um Mac, didn’t you get the memo. If data observations data does not match the models then the data is Wrong. Though Keyner and company have added to our understanding of the Norwegian model and its’ flaws, there is in fact novel science (a better understanding of the stability parameters you need to use to fully model occlusion) in the Schultz piece. That the press is covering this as a revelation never before seen is not Schultz’s fault. Schultz is, in fact, an outstanding scientist and deserves more respect than what you’re showing here. There was an interesting occluded front involved in huge October Rains in Southern New Hampshire, back around 1998 or so. It didn’t weaken, but instead acted something like a pipeline, stretching from a warm sector holding an unwinding hurricane, …. The surface cyclone became occluded over Pennsylvania and New York, and this occlusion drifted slowly across southern New England, with wave intensification taking place offshore along the frontal boundary on 21 October. … In addition, at the peak of New England rainfall on Monday 21 October, Hurricane Lili was a category 1 hurricane and was located at 34.20°N, 57.20°W (about 1400 km southeast of Cape Cod, Massachusetts) at 1000 EDT. It is generally believed that this tropical cyclone advected tropical moisture to New England, enhancing the amount of precipitable moisture entrained in the system over the New England states. However, the interaction between these two storm systems is not completely understood and perhaps warrants further examination. There have been a few storms with striking satellite images showing a moisture feed from the Carribean to New England. They generally produce a lot of flooding. I think they’re a bit similar to the “Pineapple Express” that feeds moisture into northern California storms. Looks like a link with the word ‘direct’ to me. I got these two out of the library at my university today. Good stuff! Tallbloke, glad you enjoy it! Seems to me that T.N. Carlson had this idea twenty years ago. In his 1998 AMS monograph there is this sentence in a section devoted to the complexity of the occluded front. “High winds, accompanied by blowing and drifting snow in the wintertime, may give the correct impression in winter storms that the occluding front is powerful.” On the next page is a satellite photo of an occluded front that I remember well on the eastern Wyoming plains in April, 1988. That storm was amazing. I had never seen the flood control reservoir near my house more than 50% full, but that storm filled right up and water nearly started flowing through a wide, emergancy spillway around the side of the dam. The large pond behind the dam became an impressive lake. A huge amount of water was held back, and the people downstream should have been kissing the feet of the Army Corp of Engineers for work they did, back in the early 1960’s. I got a little worried when I noticed small springs had appeared at the base of the dam. If that dam ever gave out, with that amount of water behind it, it would wipe out my town. I was so worried that I went back with a flashlight after dark to check on those springs, to make sure they weren’t getting bigger. The Corp had been there before me. Every spring was marked with a small flag. It was reassuring to know that, among so many government employees who don’t work all that hard, there was one out in a downpour, checking the dams. Much to Dr. Schultz’s chagrin this is not what I learned when getting my Bachelors of Science in Meteorology. The occluded stage of a low pressure systems is the most intense and generally when the most severe weather is present during the life cycle of the low due to the proximity of the jet stream supporting the low and the related temperature gradient stacking down to the surface. Long-time lurker, first-time poster. Thanks to Anthony for the posting about our article. Before addressing some of the comments, let me say what this article is not about. 2) Numerical models for weather (or climate) prediction. Conceptual models are frameworks for our understanding of how the weather works. If you’ve seen a graphic of sea-floor spreading at the mid-ocean ridge, a graphic of the electron orbitals of an atom, or a graphic of an idealized cross section of a warm front, that’s all a conceptual model is. A conceptual model is a simple graphic and accompanying story that describes our present understanding of a scientific concept. So, conceptual models should not be confused with computer models of the weather, which our paper doesn’t address. Some of the comments about this post seem to be unfair characterizations of what the press release and the article are saying. It would help to at least read the abstract of our article. 1. Many others have known that aspects of the Norwegian cyclone model have been inadequate for explaining observed structures and evolutions (e.g., Carlson). We have over 170 citations in the paper, so we have placed our new results in the context of what has been known and discussed in the literature. Sometimes we are pointing out what has been published is incorrect. Other times, we are pointing out the people who have made progress in our understanding. And, also, we have some of our own new advances in the paper. We are not just restating lost knowledge. 2. There is nothing special about cyclones near Norway. The life cycle of cyclones first described by the Norwegians in the 1920s was a great step in our understanding, yet cyclones globally have been fit into their model (justly or unjustly). We have developed a much better understanding of cyclones (observationally, theoretically, etc.) now, which merits a re-examination of their conceptual model. 3. As we discuss in our article, our ideas (coupled with those elements that have been previously published) deviate substantially from what appears in all textbooks. I would have thought people would want to be presented with the latest and most scientifically accurate information. I think I have a healthy appreciation for the importance of this article on our common knowledge about extratropical cyclones, so this press release isn’t an exaggeration. 4. This article is not about Shapiro-Keyser cyclones (one alternative to the Norwegian cyclone model); it is only one small component of our paper. Our article shows that Shapiro-Keyser cyclones can be understood as having undergone occlusion in our new conceptual model. So, we are not just representing old knowledge as new. I hope that we can continue this discussion as we try to develop an improved sense of understanding among scientists and the public about how the weather works.